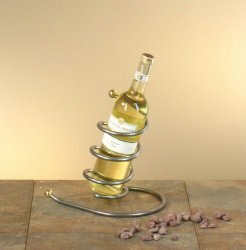 Unique wine holder that measures 9.5" H x 10" W. Metal tabletop wine holder is a "twist" on your regular wine bottle holders. It cradles your wine with a fantastic modern look. The Mortar Wine Bottle Holder fits standard 750mL bottles. We have also tried the more slender champagne bottles and these seem to fit as well.